All the useful information that you need to know before sending money with Remit2India! Launched in the year 2001, Remit2India has its headquarters located in Mumbai, India. The company is supporting 10 currencies and transfers from 24 countries to India through various options including bank transfers, ACH transfers, wire transfers, net banking, etc. One can send minimum up to USD $50 with a maximum limit of USD $50,000. These services can be used only by the Non-Resident Indians or the persons from Indian origin who are not living in India. The company does not offer spot transfers, forward contracts or third-party transfers. It has a fixed flat fee and exchange rates change as per the market prices all day. The company is providing high security to the users similar to the banks. It is also offering 24*7 customer assistance so that one can contact them anytime regarding transfer queries. 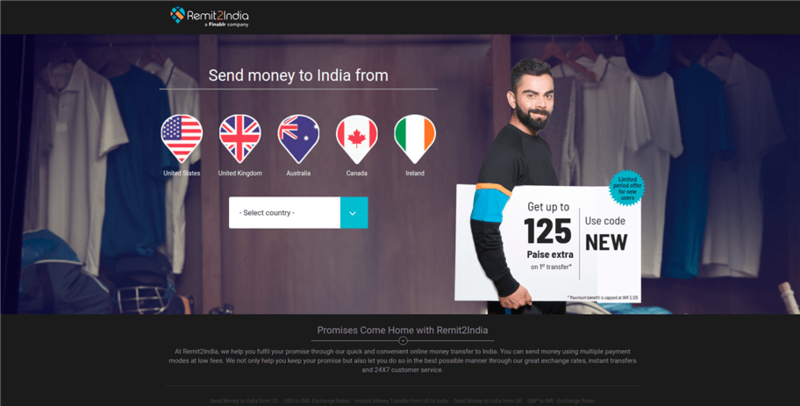 Pricing : How much does Remit2India cost? Fees of transferring funds vary depending on the currency being sent to India. If you transfer funds from Australia in AUD, then the transfers are absolutely FREE. If you transfer funds in USD, then transfers cost up to 99. Transfers from the UK are also absolutely FREE. While if you are making the transfer in EUR, then it may charge at least EUR 2.99 or 0.60% of the transferring amount. Remit2India transfer rate is highly competitive and keeps changing according to the market whole day. However, the rates get locked once you start the transaction if you choose the guaranteed rate, but if you choose an indicative rate, then it may change in between the transaction and different amount will reach to the recipient. The company might charge service tax depending on the country and its tax policy from where you are sending the funds. You will get the details of all the fees charged by the company on the transaction page. Remit2India offers free transfers from many countries and the minimum fee is also charged depending on the amount you are transferring. If you transfer a higher amount, then the fee will be less. So, we rate it 8 out of 10. Transparency: Does Remit2India have any hidden fees? The company does not charge any hidden fees between the transfers. The total amount received by the recipient will be the same as shown on the transaction page if you have chosen the guaranteed transfer rate. The company has provided an easy procedure of tracking the transfer which you can check on its “Track Your Transfer” page. Track your transfer from Remit2India here where you have to enter your reference number and registered email ID. The company has been providing the best transaction tracking procedure as well as have no hidden fees, therefore, we rate it 9 out of 10 under transparency head. Transfer Speed: How long does it take to send money through Remit2India? There are different payment routes available to transfer funds through Remit2India and the length of time to reach funds to the beneficiary can vary. It might take 3-5 working days when you transfer the funds from the bank account to the bank account. So, it has given various options to transfer funds if there is an emergency, which will attract more fees. While if you just need to transfer funds to the family or friends, then it will take less fee but will reach in a few days. So, we rate it 8 out of 10 for its transfer speed. Security : Is Remit2India Safe? The company is highly secured by various authorities in different countries and regulated by the government in all the states of the US. The website of Remit2India is certified by Norton Secured, which is one of the most trusted security companies in the world. In Canada and Australia, the company is regulated by Unimoni, which is another money transferring service provider. So, the company is using enough steps for securing the personal details of its clients and therefore, we rate it 9 out of 10. You can also request a call back from Remit2India customer assistance team here. The company is offering both Android and iOS apps which you can download here. The company provides a unique link to share it with friends and ask them to join its services. If they register using your link, then your money on referral (MOR) account will be credited by INR 500. On making the first transaction, your MOR account will be credited by INR 2,000 and INR 500 will be credited in your friend’s account. The company provides promo codes time to time to its users by notifications, email or SMS. Users can use these promo codes to get a discount on the transfer fee. The company also provides online FAQs on its website for the general customer queries. So, for the overall user experience, we rate it 7 out of 10. For starting the services of Remit2India sign up here. Coverage: How many Countries & Currencies does Remit2India support? So, you can send the funds through ACH and wire transfers from the USA and do card transfers from the UK. From other countries, you can transfer the funds through net banking or any other online method. So, for its coverage, we rate Remit2India 7 out of 10, because it is not offering bank transfers, which is the easiest mode to transfer funds. So, for using the services of Remit2India login here. Excellent customer care. Mr. Praveen was very patient, knowledgeable and helpful. He went through each step clearly and was very helpful. Best customer service experience I have has so far. Super fast service. Very reliable and the best rate they offer👌 Every month they offer special rates. So its a very valuable service. Its really fast compared to another money transfer websites. recommendable to others. website is ease to use. Sandeep gave me excellent service. Excellent service by Remit2India. very fast and reliable one. Sandeep from team helped very much in guiding through transactions. Worked with Sandeep for my transaction to India and the service was excellent. will definitely recommend using this service. I am very happy with Abhiranjan singh service.. the service is EXCELLENT. they helped to do the transaction easily. Fast and safe Money transfer and helpful customer care. The transaction service is good. Most satisfying part is till now I have been able to connect with Customer Care without any significant delay, and the staff is very helpful. The rates can be a bit more competitive based on other market contenders. Transfer was fast and website need little bit redesign and some receiver fields are not required when transferring money. I saw other websites not asking for that many fields. Anyway got very good rate compared to others. Thanks a lot. Remit2India provides great exchange rates for money transfer to India and has a very professional team to help in the process along the way. Saw an online add and used this service for the first time. It took 7 days for me for the money transfer. This is way too longer time. There are other services out there which provide better service. Not going to use this service again. Friendly Customer care and better price. Go to the Remit2India website. Select the country you want to send money. Here you will see the exchange rate which company is offering to the users. Here you need to login or sign up if you are a first time user. Enter all the details as asked by the company for registering yourself. Recheck all the details and send the funds.